The strandline is not simply a place where rubbish and seaweed is dumped, it is also a place where creatures hunt and feed. Insects are one of the largest groups that take advantage of what is washed up. In turn, other creatures, such as birds, prey on them. The strandline provides plenty of places to hide - amongst seaweed, in driftwood and in the holes mades made by sandhoppers so they are ideal hunting grounds for insects. 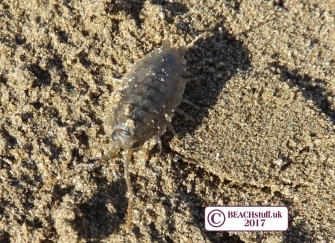 The sea slater is a close relative of the woodlice we find in our gardens. This woodlouse, however, is much larger than our garden version and is a marine creature. It is often found hiding out in rockpools where is likes to eat bladder wrack. 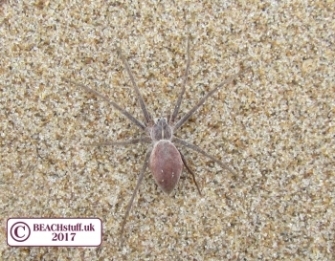 Occasaionally, they stray onto the strandline, like this one pictured. A matt black beauty! 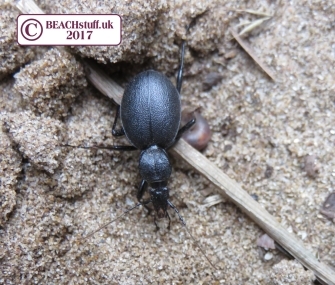 This is a type of coastal ground beetle which can be around 2 cm long. 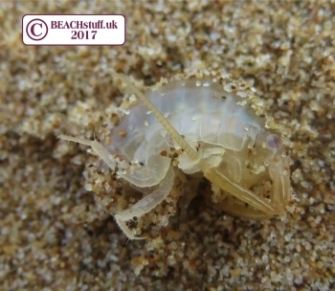 On the strandline they live in seaweed and in driftwood and hunt sandhoppers and isopods (a marine woodlouse). They are nocturnal so we don't often see them during the day. 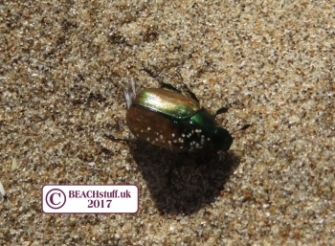 This pretty beetle is distinctive because it has golden brown wing cases (covering its back) and a bright metallic green head. The male flies but the female cannot. 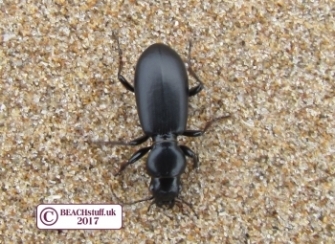 They are about 1.5 cm long and, on the strandline, feed on rotting vegetation. The narrow head of this type of ground beetle means that it can get right inside a snail shell where it feasts on snail flesh. Things don't always go to plan though. The video below shows a snail hunter which has itself been caught by its prey. A round-mouthed snail has trapped one of the beetle's legs using its trap door. 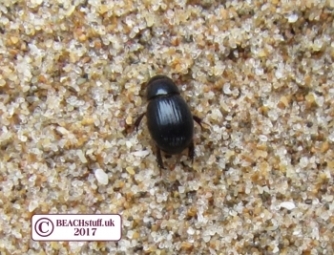 As the name suggests, they like to feed on dung and so individuals found on the beach may have fallen from nearby dunes. Dung beetles are very important on our sandiest soils as they help to release the nutrients from dung and integrate it into soils making it easier for plants to colonise. 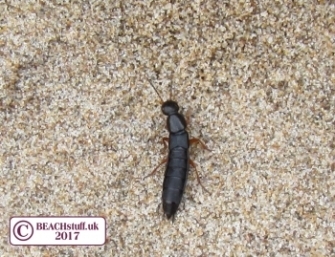 Rove beetles live in all sorts of different habitats, and this little species (less than 1 cm long) lives on sandy beaches. There it lives amongst seaweed and feeds on whatever insect and decaying matter it can find. 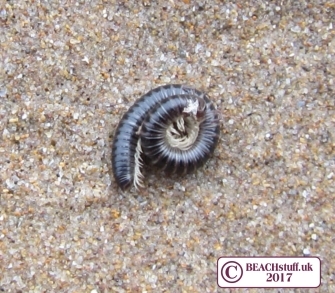 These millipedes are often found liviing on dunes where they feed on decaying vegetation. Sometimes they stray, or perhaps fall, onto beaches. See the tracks it makes in the sand here. 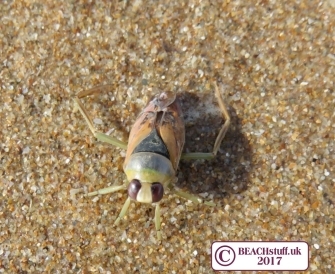 Backswimmer bugs get their name from their habit of swimming upside down - but they usually swim upside down in inland - non-sea water - canals and ponds so what this one was doing on a beach, I have no idea. Amazingly, it was still alive when I found it. This spider gets its name from the protective web the female makes to protect her offsprings. They often live in dunes and may stray onto the beach in search of their prey - flies and small insects. 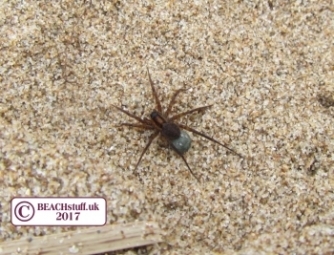 The wolf spider feeds on insects and other spiders and comes to the strandline in search of food. 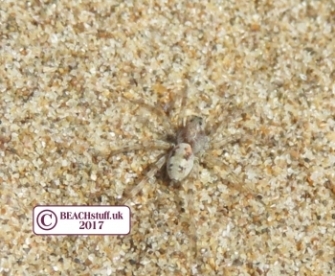 They rely on camouflage and this wolf spider on the left was very hard to see on the sand. The wolf spider below was easier to spot (and you can also see the egg sac she is holding behind her) so probably is a different species of wolf spider (there are many). Harvestmen are very commonly seen (with their small round bodies and long thin legs) and commonly mistaken for spiders. They may look like spiders but they are only related, not actual spiders. 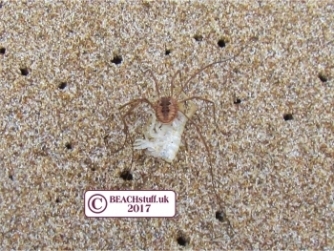 The harvestman pictured has grabbed a sand hopper (one of their favourite strandline feasts). 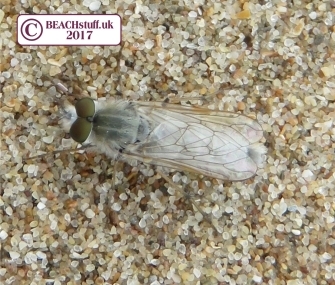 This fly is a common visitor to our strandlines. Anyone want to have a stab at idntifying him? Any ideas to hello@beachstuff.uk. We'll post your ideas here and any relevant photos.